So, I’ve decided that as I have a horrendous tummyache and it’s nearly midnight, this would be the perfect time to blog about a recipe of heavenly badness that I enjoyed last weekend. The best part is it’s easier than eating biscuits. Easier than painting your nails. Easier than making a paper aeroplane out of an old shopping list. I’ve tried all of these today, so I know. 2 punnets of raspberries. No, you can’t have one yet. 3-4 heaped tbsp golden caster sugar. It’s okay, it’s calorie free. Oh, and you’ll probably need a very funky blowtorch. We, of course, used a dragon. 1. Whizz the biscuits in the food processor until they’re crumbs. 2. Stir in the melted butter and golden syrup. Get a bit sticky. 3. Press over the base of a 24cm loose-bottom tin and put it in the fridge to chillax, all the while thinking about how funny the name ‘loose-bottom tin’ is. Just us? Oh, right. 1. Sprinkle the gelatine over 3 tbsp cold water. Leave until it goes a bit soggy. 2. Microwave it for a few seconds until it’s all melty, then stir until it becomes clear. 3. Put the soft cheese, egg yolks and sugar into a bowl and whisk until smooth. 4. Whip the double cream until stiff. Ditto the egg whites with a whisk. 5. 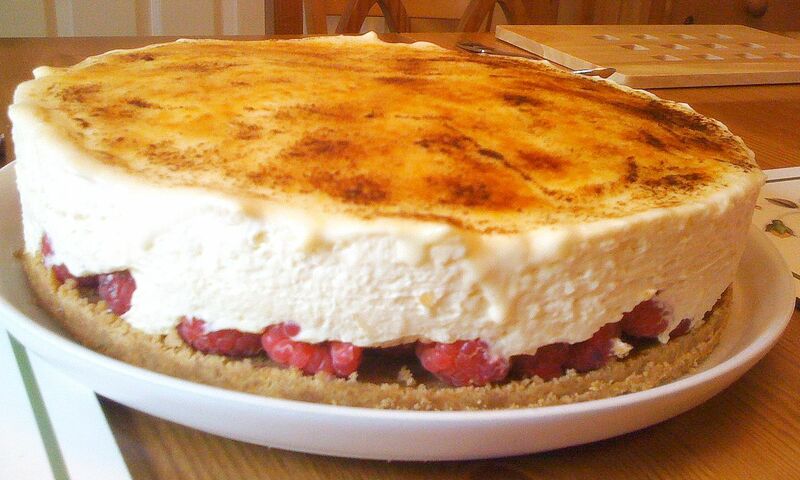 Stir the cheese mixture and vanilla extract into the cream, along with the gelatine. Fold until everything is all blendy. 6. Fold in the egg whites. 8. Pour the cheese mixture over the raspberries, make the top all smooth and pretty, then leave it to chill in the fridge overnight. 9. If you manage to refrain from eating it in the middle of the night then well done – you are a better person than us. Sprinkle the caster sugar over the top. 10. Use the blowtorch to melt the sugar until it goes all bubbly. Laugh manically as you do so – it makes you feel like a Bond villain. Mama claims this serves twelve, but I think really it’s an ideal meal-for-one. What are you still doing reading this? Go and make one. NOW. Images are all mine, baby. 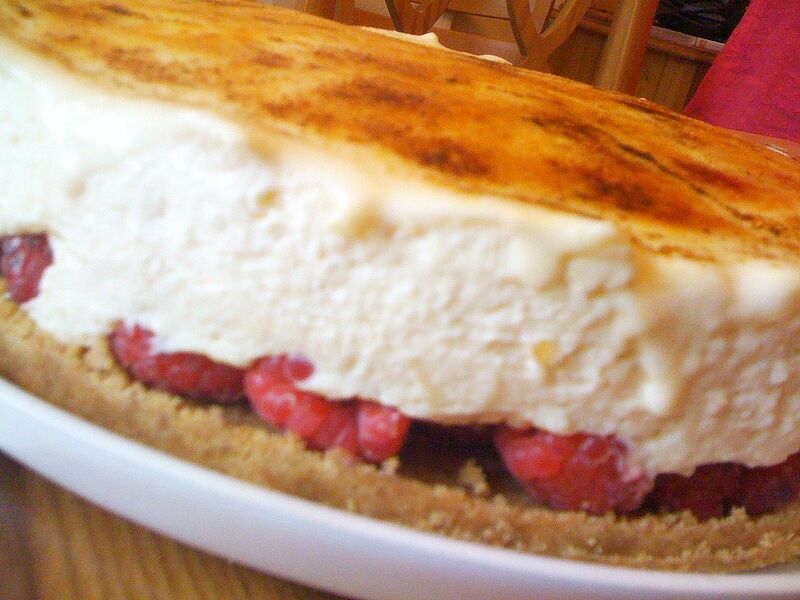 This entry was posted in FOOD&DRINK, Nom and tagged blowtorch, bond villain, brulee, cheesecake, dessert, easy, OMNOMNOM, raspberry, raspberry cheesecake, recipe, Summer by Laura. Bookmark the permalink.